Which CMA Part Is Easier? Namita is a Charterd Accountant by education who is fascinated by adding value and assisting students to get professional qualifications. She is working as VP Academics at Apex Institute. On April 1, 2018, the AICPA will be updating certain CPA Exam design and function features. These changes will modernize the look of the interface and make the test-taking experience easier for candidates. 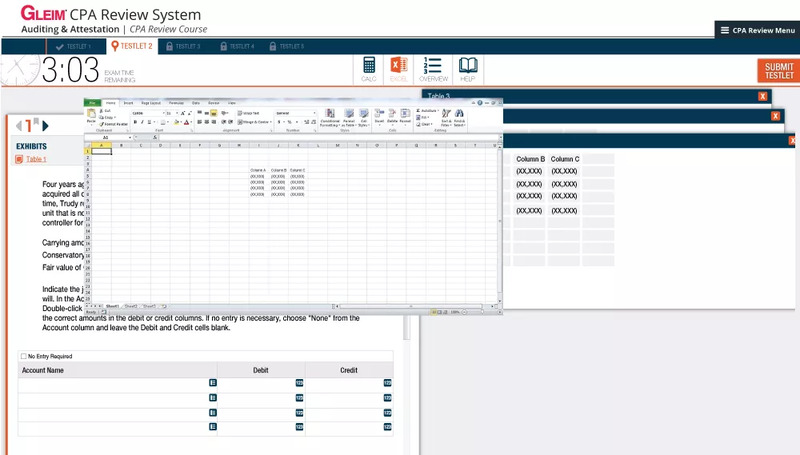 Instead of the proprietary spreadsheet used previously, candidates will now have access to the desktop version of Excel, which launches by clicking the spreadsheet icon found in the top toolbar. The Exam spreadsheet will perform all of the same essential functions as a regular desktop Excel spreadsheet. In addition, candidates can easily transfer data out of and in to Excel, for example, by copying from Excel and pasting to the answer fields of a simulation or into the Calculator, and vice versa. 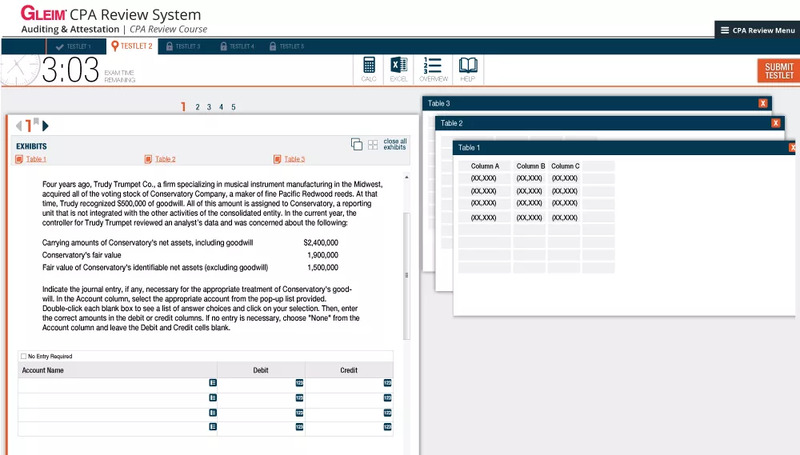 Excel will retain all of the information entered while in a testlet, even if Excel is closed and/or when navigating between questions/simulation. Excel will only clear when beginning a new testlet. There is also an option to manually save any work. Work done and calculations performed within Excel will not be graded. Many of Excel’s shortcuts and some functions of Excel that may threaten user security will not work. 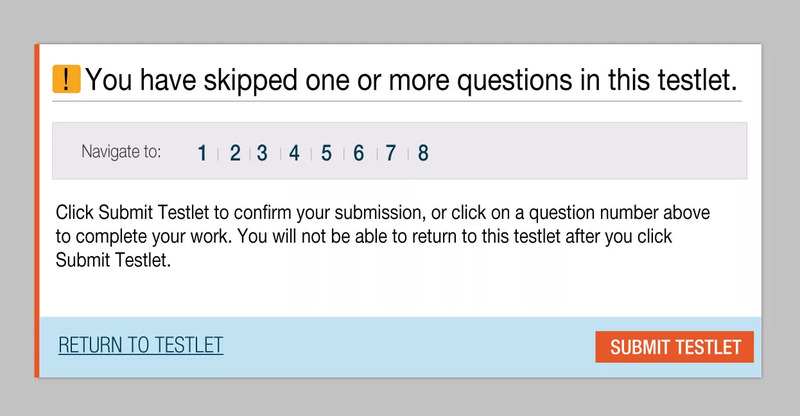 The information and navigation bar at the top of every testlet screen has been rearranged and redesigned. 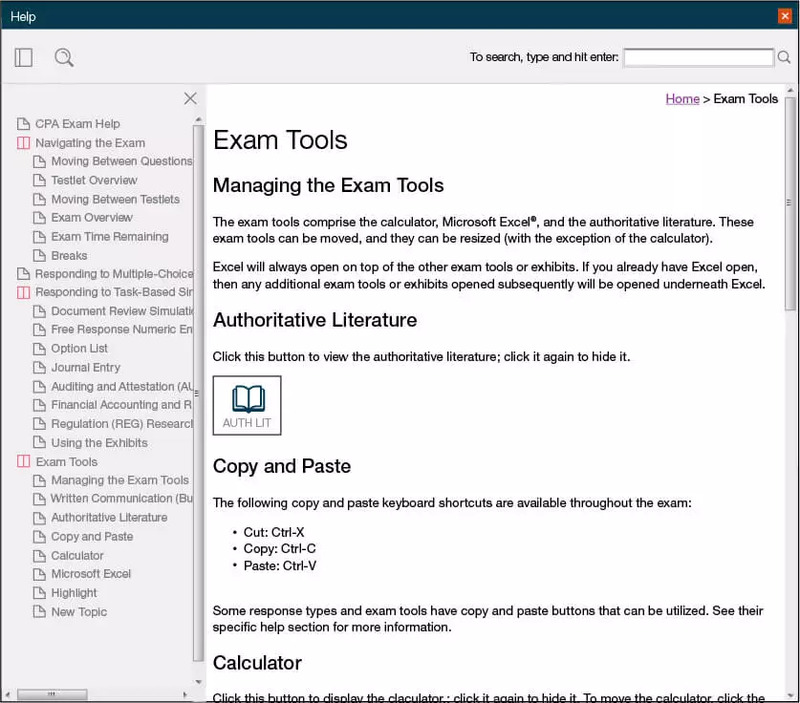 The exam timer has been moved to the top left corner of the screen, underneath the testlet tabs. The format of the timer changes slightly as it counts down to different time increments. The Calculator, Help, Excel, and Overview buttons, when appropriate, appear in the middle of the top bar. 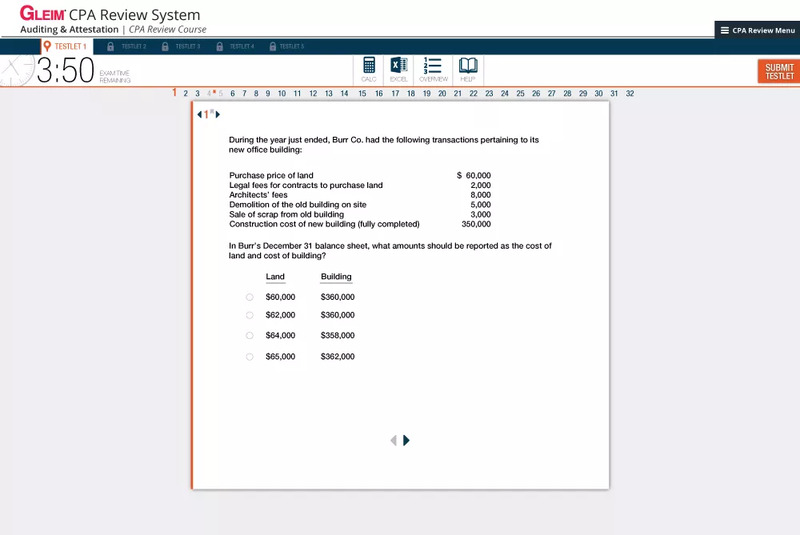 Excel and the Overview tool are new to the 2018 version of the exam. Question navigation has moved up to the top of the screen, right under the toolbar. The Calculator, Help, Excel, and Overview buttons appear in the same container as the timer. 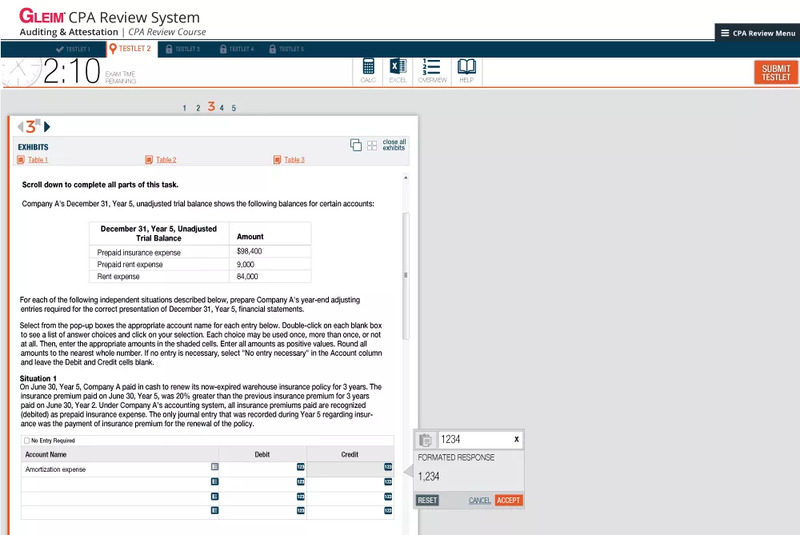 Excel and the Overview tool are new to the 2018 version of the exam. The Calculator has improved functionality, and its ability to interact with the other parts of the exam has been extended. 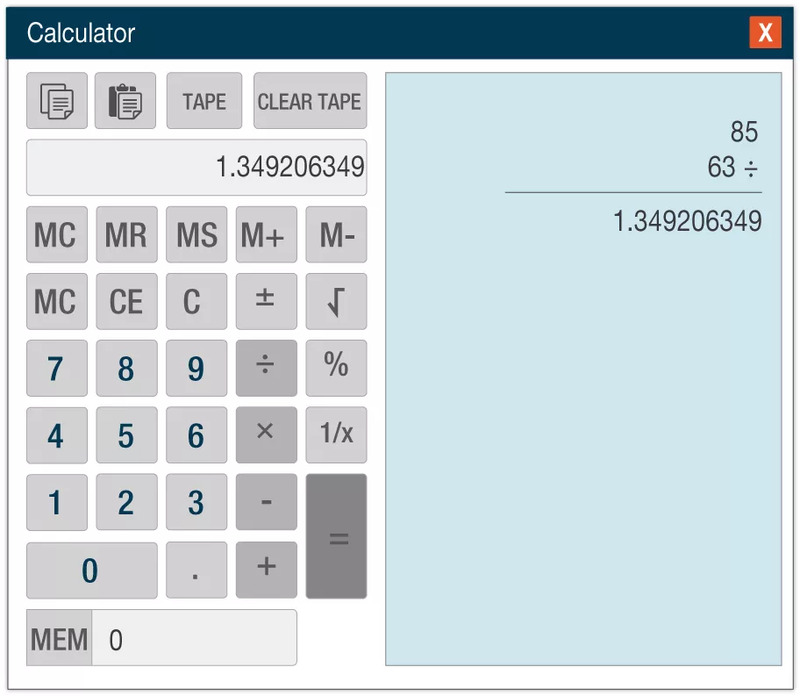 The Calculator tape is saved and accessible throughout the entire testlet; it does not clear until a new testlet is entered or the “Clear Tape” function is employed. Numbers (but not text) can be copied and pasted between the Calculator, the TBS exhibits, the question content, and Excel. The Overview icon launches a popup box that lists all the testlet questions in numerical order. The first sentence of the question is presented beside each question number. Help has been dramatically redesigned. Instead of being presented as one page of static text at the beginning of each testlet, there is now an icon that is present in the top toolbar for the duration of the exam. This icon opens an extensive file that provides all of the most important information about exam navigation, question responses, and exam tools, which can be navigated either via the table of contents or using the search bar. 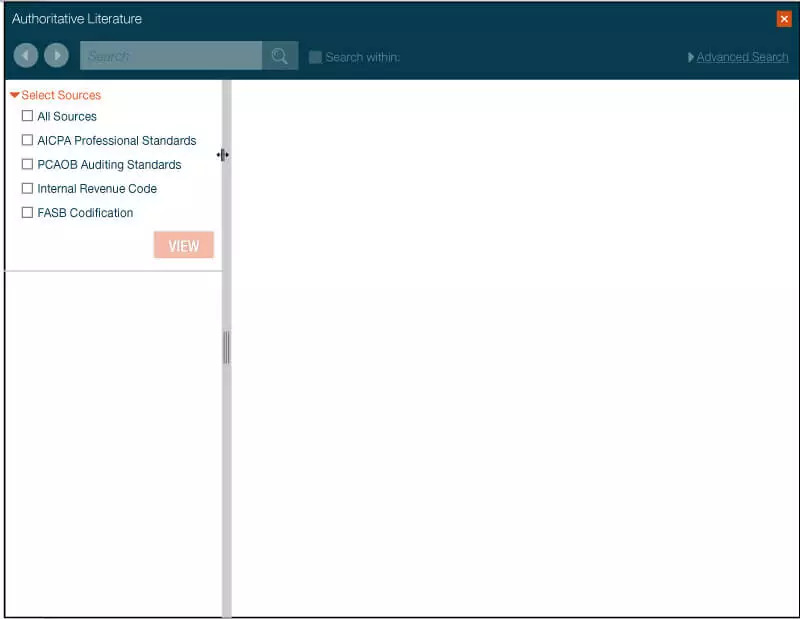 The Authoritative Literature tool has a new look and new organization that allows candidates to search within any or all of the different sources for any section. The table of contents will not populate until a source has been selected. An extremely useful new features is that candidates can bookmark a document by clicking the bookmark icon next to the document title. 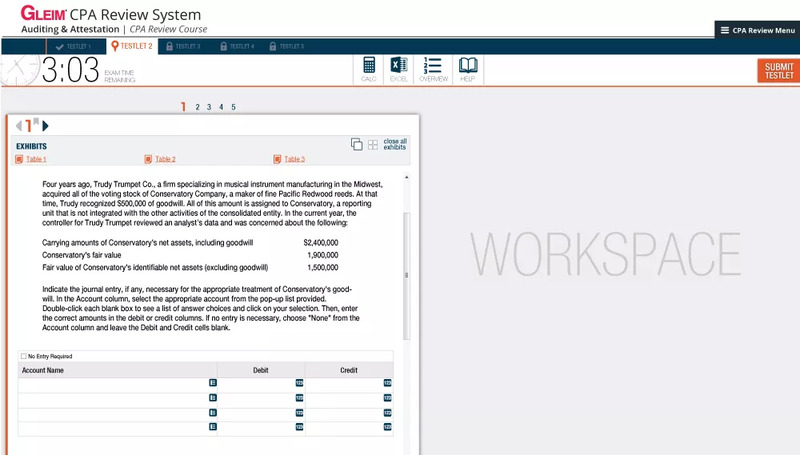 All bookmarked documents will be listed in a new section that appears above the table of contents, and hovering over the bookmarked items reveals the full title in a popup box. The Advanced Search options have been altered to include: • “All of these words”: multiple words at a time, in no particular order • “This exact phrase”: exact words in an exact order • “Any of these words”: one or more of the entered words in no particular order • “None of these words”: none of the words entered Clicking the “Search within:” box next to the search bar allows candidates to limit their search to a specific folder or sub-folder. Within the Advanced Search field, candidates must once again click the “Search within:” box in order to limit their search to a designated sub-folder, even if the “Search within:” box is activated for the basic search. 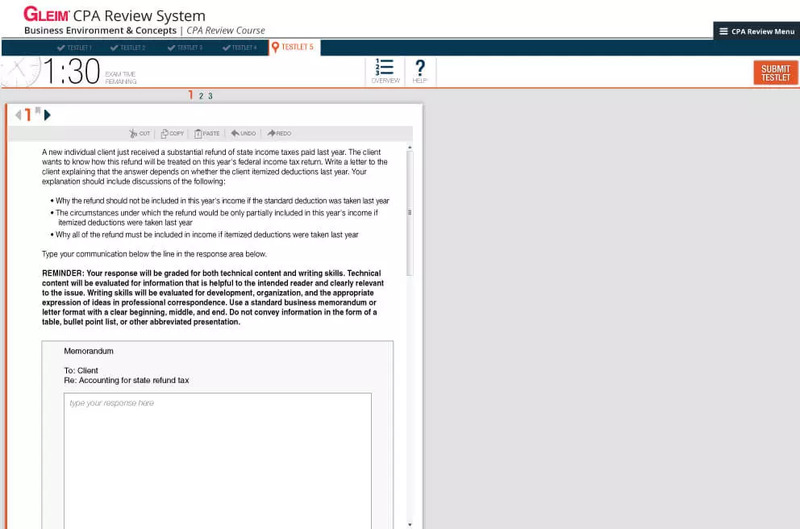 The search function of the Authoritative Literature tool can be used at a basic level to find words or numbers, but a search can be enhanced with an asterisk, which searches for anything starting with the word, or with a question mark in place of a character, which indicates that any character can appear in that specific position in the search term. Up to three question marks can be used. 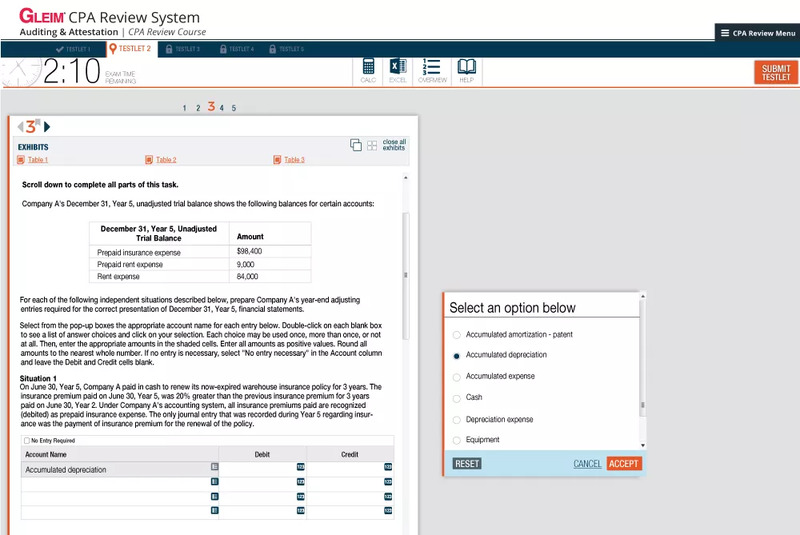 The old vertical and horizontal split screen functions in the Task-Based Simulations have been replaced by a designated work space where all of the exam tools and exhibits open. Instead of being separated into different tabs across the top of the screen, the exhibits are now located within the simulation, just under the question number. When one or more exhibit is opened, they can be arranged with the Cascade and Tile buttons, but no more than eight exhibits can be open at a time. Open exhibits in one simulation cannot be seen after you navigate to another simulation, but the exhibits in the first simulation will be open when you return to that simulation. Numbers from exhibits can be copied and pasted into the number answer fields in the simulations unless the exhibits specify that they are “Read Only” in the exhibit title bar. 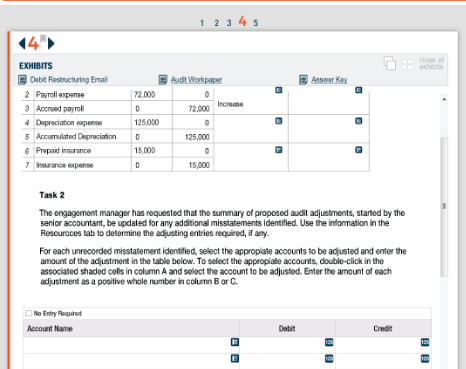 An IRS form is an example of a read-only exhibit. In addition, within non-image exhibits, you can select text with your cursor for a Highlighting toolbar so that you can apply or remove highlighting to text you want to easily refer back to later. Journal entry simulations received a relatively high amount of changes to make them easier to complete. An icon indicates the type of response required for each cell. • A period – formatted response begins with a zero. • A negative number – the formatted response includes parentheses around the answer • Open and close parentheses – formatted response contains open and close parentheses • Open parentheses – formatted response will not include this invalid character. 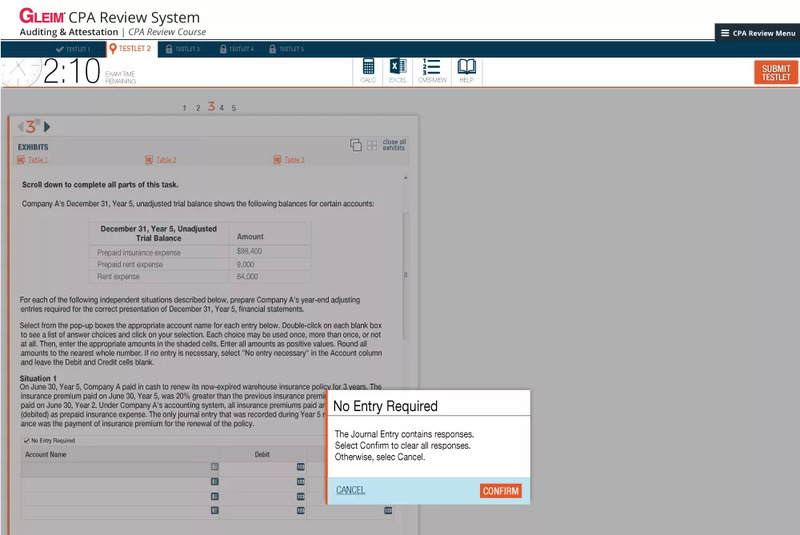 A small box above the journal entry table that reads “No Entry Required” now allows candidates to indicate that any given transaction does not require a journal entry. 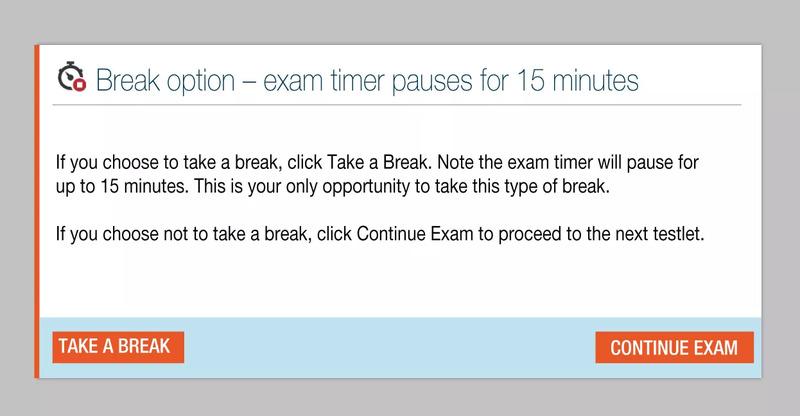 Clicking this box disables the table and summons a pop-up warning that all entered answers will be cleared if confirmed. If confirmed, the exam will then records the answer as “No Entry Required”. Deselecting the small box reactivates the journal entry table. There is a new kind of simulation known as the global response grid, which features multiple spreadsheet/table-response type questions within one simulation separated by text blocks with different questions or instructions. The questions cater to more complex items and may involve filling in a balance sheet or whole journal entries. The appearance and functionality of the Written Communications toolbar has been updated. The toolbar now remains visible as candidates scroll down through the response area, and the operations of undo and redo are now only possible using the buttons on the toolbar, not the keyboard shortcuts Control Z and Control Y.